Our supporters continue to enhance the impact of the Muscle Movement Foundation's programs and services. Supporters give to MMF because we continue to fulfill the unmet needs of families who are affected by muscle disease. An organization founded by a family affected by muscle disease, MMF understands the obstacles that families endure from a first person perspective. Our unique experiences and expert staff help MMF redirect donations to create the greatest impact in our families' lives. MMF combats neuromuscular disease by way of assisting families through physical, financial, and emotional accommodations. Through inclusion, we create opportunities for all Muscle Champions to travel, participate in sporting events, social events, and more - to showcase their abilities! MMF's life-changing accommodations and inclusive services enhance the physical and emotional well-being of our families in need. We help build friendships, develop support systems, provide resources, develop life plans, educate, and provide emotional support to help our families live life stronger! The MMF Staff and Leadership Team is currently 100% volunteer. This ensures that 100% of your philanthropic dollar truly provides life-changing support. Supporters believe in our cause! Fighting muscle disease through emotional support, inclusion, and accommodations. Supporters continue to witness the tremendous impact MMF creates in the lives families who are affected by muscle disease and communities across the U.S. Supporters know their donations are used for the intended purpose! Families who are affected by muscle disease continue to choose MMF because they enjoy MMF's individualized experience. We are all about helping our families live life stronger. Giving to MMF will do just that! Donate a wheelchair accessible vehicle! Donating your vehicle is a wonderful way to receive a federal tax deduction and support our cause! Note, wheelchair accessible automobiles are in high demand. When a family donates a wheelchair accessible automobile to the MMF, we can guarantee a new home for your vehicle! Email info@musclemovementfoundation.org and check out IRS Pub. 4303 to donate your vehicle! Charitable bequests are donations or gifts to the Muscle Movement Foundation, designed as a part of a trust or will. A bequest gift is a way to leave a strong legacy in the muscle disease community through MMF. Please ensure you inform us of your bequests so we can utilize your gift/donation as intended. The Muscle Movement Fdn. also asks for you to clearly communicate your bequests on behalf of MMF to your family members and beneficiaries. 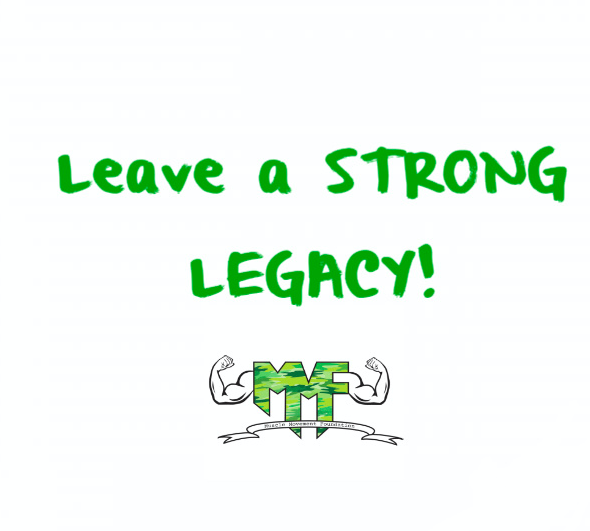 MMF will ensure your legacy is life-lasting for many generations to come! Call your credit card provider and discuss your terms and conditions. Many providers allow their users to donate unused points, miles, or cash back rewards to the Muscle Movement Fdn.! This is a fun way to provide support to families affected by muscle disease without donating from your bank account. Supporters who enjoy shopping can now shop at Amazon.smile.com and support the Muscle Movement Fdn.! Select the "Muscle Movement Fdn." as your charity of choice and Amazon donates 0.5% of your purchases to MMF. Employers host annual events that bring their employees together for our special cause. Game nights, dress down days, bingo nights, "cook-offs", raffles, boss lock-ups, wine and cheese night, BBQ, a company car wash....The ideas are endless! Contact us prior to your event to request for our Founder/President, Rob DeMasi, to speak and/or have a Muscle Movement Fdn. Muscle Champion attend your event! Some employers donate to MMF when their employees fulfill a certain number of volunteer hours for our organization. Ask your employer if they are willing to donate to MMF, if your colleagues donate their time to MMF's volunteer services. Volunteer your time at MMF events, make phone calls from the comfort of your home to enhance community engagement in your area, organize a support group, and more! Contact MMF for more volunteer information! Click here! Some employers offer the opportunity for their employees to contribute to the Muscle Movement Fdn. through payroll donations. A specific amount of your choice can be deducted from your paycheck and contributed to a MMF family in need! Go to work everyday with our affected families in your heart. Many of our families would give anything to have the physical ability to work a full time job! Donate gift certificates, gift baskets, food, or beverages to ensure the success of our MMF events! We will use your product or service as a raffle item for a lucky MMF supporter! Visit the MMF Events link to view upcoming events! Donate your product/service to improve the quality of life of our families in need. Massage therapists, physical therapists, occupational therapists, nutritionists, acupuncture practitioners, and others donate their services to MMF's families in need! Check out IRS Pub. 526 for information about specific charitable contributions. Many employers offer a gift-matching program! This ensures your donation will have twice the impact. Prior to making a donation to the Muscle Movement Fdn., ask your employer if they offer a gift-matching program, or are willing to match your donation. A "matching gift" is a donation by an employer that matches an employee's donation to the Muscle Movement Fdn. Your employer may match your donation dollar-for-dollar or even double or triple it!